Situated near Mississippi's Gulf Coast, just 45 minutes from New Orleans, John C. Stennis Space Center is a unique federal city that continues to feel the positive results from increased construction, expansion, and collaboration. The Center is seeing tremendous growth by its existing tenants and the addition of new agencies, companies, and groups to the facility. NASA's mission at Stennis includes managing NASA's rocket propulsion test programs and facilities for current and future space vehicles, and providing test services for government and commercial customers, while another mission includes Earth science applications. Scientists at Stennis conduct a broad range of remote sensing applications projects with a focus on developing systems and tools to better monitor and manage the health and productivity of our nation's land and coastal resources. A TRW 650K Low Cost Pintle Engine undergoes hot fire testing at Stennis' E-1 test stand. The test article achieves a high level of power without a high cost because of the simplicity of its design. Physically, the TRW 650K is the second largest engine ever tested in the United States. Stennis Space Center is NASA's lead center for rocket propulsion testing and manages the Agency's rocket propulsion test assets, including facilities at the Marshall Space Flight Center in Alabama, the White Sands Test Facility in New Mexico, and the Glenn Research Center Plumbrook Station in Ohio. Building on a role in engine and vehicle testing that spans 30 years, Stennis is the Center of Excellence for propulsion testing. 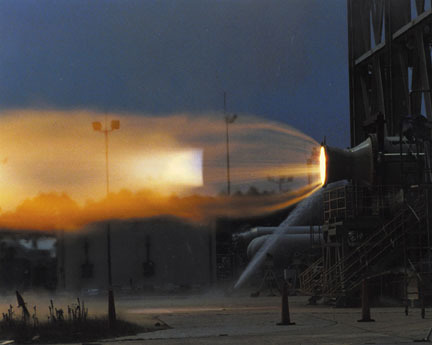 Every Space Shuttle Main Engine (SSME) undergoes acceptance testing at Stennis. The engine is installed vertically in one of two large test stands where a series of test firings are performed. Once proven flight worthy, the engine is transported to the Kennedy Space Center in Florida where it is installed on an orbiter. Safe and affordable space transportation is the highest priority for NASA's Space Launch Initiative. This priority provides commercial industry with the opportunity to meet NASA's future launch needs. By conducting testing on engines for the X-33 and X-34, Stennis researchers gained a wealth of technology that can be used for future vehicles. This is vital since Stennis will continue to play an integral role as the lead center for propulsion testing in testing future component and propulsion systems. Commercial test programs are also conducted at Stennis Space Center. For example, the Center has been selected to assemble and test the RS-68 engine and the common booster core for the Boeing Company's Delta IV rocket. The RS-68 is the world's largest liquid-hydrogen, liquid-oxygen engine. Boeing has leased the B-1 test stand from NASA for these tests. Stennis' E-Complex test facility serves as a developmental rocket engine component test facility for future generation rocket engines. The flexible three-stand complex can carry out rocket engine testing and other types of testing involving ultra high-pressure gases and high-pressure, super-cold fluids. One of its first uses was to ground test rocket engine components for the Reusable Launch Vehicle (RLV) program. Stennis research engineers also use the E-Complex facility to advance knowledge in test technology areas, such as instrumentation, the study of exhaust plumes, test facility design and capability, and data acquisition. Stennis Space Center is also NASA's lead center for Earth science applications. Its mission is to "extend the benefits of Earth Science Enterprise's (ESE) discoveries, knowledge, technology, and data beyond the traditional science community­to turn Earth science results and capabilities into practical tools for solving practical problems." In support of NASA's ESE, the Geospace Applications and Development Directorate (GADD) at Stennis conducts a broad range of remote sensing applications projects. Remote sensing is a way to gather information about the Earth using aircraft or satellites. By using digital images, interpreting photographs, and comparing results to ground truth data, the GADD provides information that has real-world applications. These applications have the potential to enhance our quality of life and to create new products, services, and industries based on NASA-developed technology. Some of these applications include land-use mapping, flood plain management, crop condition monitoring, forest management, environmental monitoring, and natural hazard assessments. This emerging multibillion-dollar industry has the potential to increase U.S. economic competitiveness in world markets while providing NASA with a reliable commercial source for scientific data. 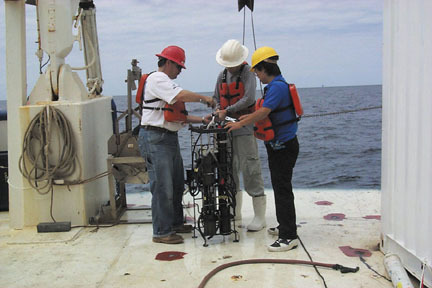 Scientists at Stennis also conduct coastal aquatic research using remote sensing technologies. Remote sensing instruments, both airborne and satellite, are integrated with scientific disciplines such as biology and geochemistry to study the role of coastal environments in marine biochemical cycles. This research is important in understanding how light is transmitted and reflected through water, and how this may be applied through the use of remote sensing in coastal environments. NASA personnel are also involved in seatruthing, which involves going out to an area of the ocean and taking measurements of phytoplankton, sediment, and other constituents of the sea. Seatruthing, used to verify and calibrate data acquired by remote sensing satellites such as the Sea-viewing Wide Field-of-view Sensor (SeaWiFS), is expected to play a major role in global climate change research. Dr. Richard Miller, left, chief of NASA's Earth System Science Office (ESSO) at Stennis Space Center, works with post-doctoral student Yuan Jinchun, right, and a crew member in preparing a bio-optics package for underwater data collection. The advancement and application of new technologies in government and commercial products and services has always been important to the well-being of the United States. Since its inception in 1958, NASA has been an important source of much of the nation's new technology. The Office of Technology Transfer at Stennis works to identify technology development opportunities and make these available to domestic companies as commercial products. It does so by making technologies available through public licenses and partnerships, providing technical advice, and acting as a clearinghouse for technology needs. NASA's Commercial Technology Program provides a variety of opportunities for the American public to work with NASA in the transfer of technology, including licensing opportunities, dual-use projects, Small Business Innovation Research and Small Business Technology Transfer (SBIR/STTR), and technology assistance. An integral part of the Stennis community is its education programs. The Office of Education is dedicated to fostering a continued growth in student participation and success in the areas of science, mathematics, geography, and technology. The Office is also responsible for the design and implementation of other educational programs aimed at improving America's schools and supporting the nation's education goals. Programs developed at Stennis are supported or implemented at the local, state, and national levels. NASA's Educator Resource Center (ERC) offers a vast collection of material for educators, including hundreds of videotapes, computer software, printed materials, and lesson plans that reflect the most recent scientific discoveries about space, oceans, and the Earth. The ERC also provides professional development opportunities for educators through workshops and seminars. A computer center and the Mississippi Interactive Video Network help teachers integrate state-of-the-art technology into their classrooms. NASA played a key role in creating the Gulf Coast Education Initiative, an innovative effort to promote and support the efforts of six Mississippi counties and one Louisiana parish to develop a quality education system. This program was designed to ensure that students master the skills necessary for future success in America's high-tech environment. New business is booming at Stennis. The State of Mississippi is constructing a new high-tech aerospace park at Stennis and the first occupant will be the Lockheed Martin Propulsion, Thermal, and Metrology Center. Adjacent to this park will be the new Department of Defense Space-Based Laser Performance Test Facility. Lockheed Martin's Space Systems and Technology Services companies teamed with the State of Mississippi, Hancock County, and NASA to develop the Lockheed Martin Propulsion, Thermal, and Metrology Center. Construction of the 220,000-square-foot facility began in 2001 and will produce propulsion systems, such as thrusters, used for satellites and other spacecraft the company produces. The thermal control systems produced at the facility will protect space vehicles from the extreme temperatures of the space environment. The Pentagon's Ballistic Missile Defense Organization has slated construction of a $140 million facility at Stennis to test its proposed Space-Based Laser (SBL) to begin in the first quarter of fiscal year 2002. The facility will be used to evaluate beam quality, efficiency, and power levels for a prototype megawatt-class hydrogen fluoride laser. The future is certainly bright for Stennis Space Center. Its employees take pride in meeting the challenges of providing excellent customer service and fulfilling the needs of the American taxpayers who deserve high returns on their investments.